City Council Report: What’s the Best Way to Waste Time? Councilwoman Carolyn King Arnold aims to find out. Wednesday’s City Council morning open mic session began with regular speaker Robert Chicarelli, whose last appearance a few weeks back began with an angry exhortation to the council members to “pay attention, very much, right now.” Chicarelli, who is homeless, began this time by noting that we don’t know what newly minted City Manager T.C. Broadnax did regarding homeless issues in the previous cities he oversaw and that he should thus be prevented from doing anything here until we know what he’s going to do. He also accused Broadnax of being an insider, as well as an outsider, insomuch as he’s new to Dallas, even though Chicarelli himself is clearly a Yankee with an obnoxious Yankee accent. He concluded, as he did last time, with a threat to “go to jail on purpose” this weekend. The next speaker, another homeless fellow, also went after Broadnax, though on grounds that were more difficult to follow, later accusing Mayor Mike Rawlings of having roped off the seats directly behind the speaker’s podium so that the black and Hispanic schoolchildren who were there for a field trip wouldn’t appear on television. Then the mayor and the homeless man got into a dispute over whether the homeless man could use his remaining 36 seconds to just stand there or if he had to sit down if he didn’t have anything to say. A compromise was made by which the fellow continued talking, this time about how Rawlings’ family owned slaves. Actually, you should just watch the whole thing here, starting at 5:23. She triumphantly recited the tracking numbers on packages she’d sent the day before to the Supreme Court detailing an incident, described at a previous meeting, in which the city had oppressed her. It was unclear whether the packages also included information on the prostitution ring she’d previously accused Mayor Pro Tem Monica Alonzo of running. 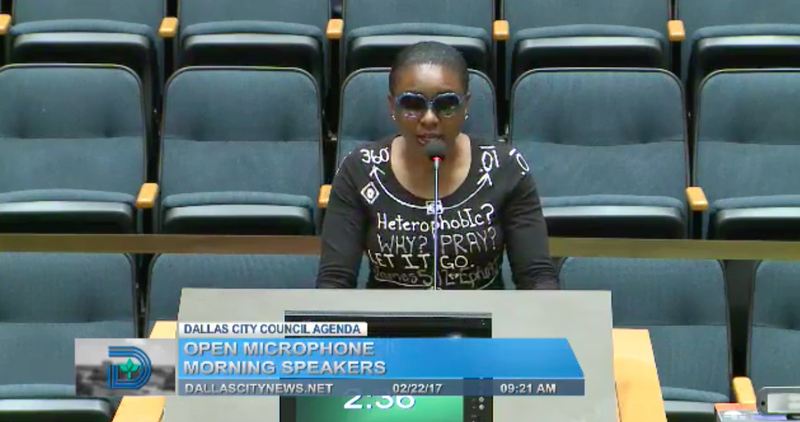 The first real speaker, DISD Trustee Bernadette Nutall, gave a passionate speech in favor of the proposed Hatcher Gardens Project, itself the day’s key issue. Originally planned as a low-income housing development to be located near Hatcher Station, the project has been held up due to a recent Supreme Court ruling that prevents HUD-funded housing from being placed in such a way as to perpetuate racial segregation and/or economic disadvantage, regardless of actual intent. Regardless of the Supreme Court’s own actual intent, HUD’s subsequent policy changes requiring housing to be built in areas characterized by high levels of economic opportunity has prevented one of four upcoming city HUD projects — Hatcher — from going forward as planned. You wouldn’t have gleaned much of this from listening to Nutall, who only referred to the actual ruling in passing while laying the real blame on unspecified “petty politics” and claiming that the “the city” would rather the money go unused than to build a project in South Dallas. Councilwoman Tiffinni Young, who clearly understood the actual reason why Hatcher had been shot down but didn’t want to harsh anyone’s populist buzz, gave a vague statement in favor of affordable housing and then asked Broadnax to “speak to city policies and where this project fits in … to city policies,” which he promptly did, reading a summary of the Supreme Court decision, the policies HUD adopted in response, and the process by which it had been decided — by staffers bearing no particular animosity toward South Dallas — that Hatcher didn’t make the cut. Councilwoman Carolyn King Arnold asked a city lawyer if the city’s policies could be tweaked so as to get these things accomplished while still complying with the ruling. The short answer was yes. Indeed, Rawlings explained that they’d be working on this very issue during the executive session coming up in an hour. Arnold noted that the people in the audience weren’t going to get to see the executive session and that they wanted answers now. Of course, they’d already gotten to hear a long and detailed explanation from the city manager about the background and reasoning, a long and detailed explanation from a city lawyer about the viability of changing policies so that what people wanted done could be done, and an announcement that the City Council was going to go work on this as soon as they’d finished the morning’s scheduled business. But Arnold was undeterred. And so in the process of demanding immediate action, she delayed it further by giving a speech to the effect that “constituents” don’t care about “bureaucratic red tape.” A bit later, she would take the exact opposite position, but we’re getting ahead of ourselves and, worse, ahead of Arnold. Now it was time for someone else to talk, fortunately; unfortunately, it was two representatives for two competing security companies fighting over a city contract to process security alarm permits. The representative for the first company seemed affronted by something and even made remarks to that effect; the second gave off an air of confidence. Item #2 involved city staff’s recommendation to hire someone to trap feral hogs. Councilman Adam Medrano interjected to proclaim that East Dallas now had a problem with coyotes as well. The relevant staffer asserted that coyotes are “just part of the urban landscape,” which makes sense to me, but then I’m an anarchist. Councilman Philip Kingston, who’d pulled the item for individual consideration, objected to the city’s seemingly haphazard approach to wild animals. “We’re talking out of both sides of our mouths,” he said, by being all cool with coyotes and bobcats while at the same spending hundreds of thousands of dollars to trap hogs, which presumably do not constitute part of the urban landscape. The last guy the city paid to take care of this “didn’t do a thing,” he reminded the Council. “There was even a suggestion that he brought in hogs.” Kingston also noted that the city had hired a biologist a while back to determine whether trapping hogs was even a viable plan. And though the city hadn’t yet received the report that it had paid for to ensure that policy was based on data, here were the staffers, pushing for policy without having received the data that had already been paid for. As for the applicant who’d been recommended by staff to do the trapping, Kingston asked, “Why is this guy going to be better than the last guy we wasted three hundred grand on?” More broadly, Kingston cited this as an example of a wider problem whereby the Council itself is asked to make decisions without being provided with any information by which to make them. Item #44, a routine authorization to allow a developer to renovate a housing unit with a grant from the city and to rent it to a qualified household, had been pulled by Arnold, who asserted that she personally needed to have continual access to all of the paperwork regarding the work done on the unit so that she can personally check to ensure that all the paperwork is in order before the unit can be rented out, and that she needed this same information for all other renovations from now until the sun dies out. She then explained to Broadnax that it would be “very helpful” if this could always be done automatically so that she wouldn’t have to ask for it. Broadnax replied that “the level of detail” she was asking to be given, entailing “paperwork down to that degree, might be a little much,” citing the time it would take away from staff’s ability to do important, non-Arnold-related things. He suggested that it might make more sense for her to talk to individual householders if she wants to identify any problems along those lines and offered to speak to her in more detail about this outside the setting of a City Council meeting. Arnold thanked him and proclaimed that she “is all about providing education and information” and demonstrating “the challenges that we face as we attempt to do our job,” such as the challenge presented by a council member who wastes everyone’s time denouncing bureaucratic red tape and then waste’s everyone’s time demanding more of it just an hour later. For, indeed, we’ve only covered the morning proceedings; tune in Monday for a look at the afternoon session, when Arnold will read out the very same prepared statement at three different points in the course of two hours.